The Weston Community Coalition has helped publicize problems with the Georgetown Rail Corridor Expansion and Air Rail Link. The fast approach of this big project has now caught a great deal of neighbourhood attention and resulted in the forming of the Clean Train Coalition. CELOS posts e-mails from various neighbourhood lists here. Here is a picture of a Budd Rail Diesel Car. 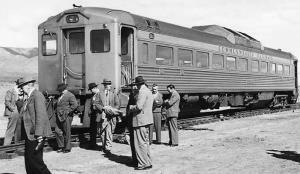 According to the Budd Rail website, this type of "North American streamlined self-propelled passenger rail car (aka Diesel Multiple Unit/DMU) was built by the Budd company of Philadelphia between 1949 and 1962. A number of these magnificent first generation DMUs are still in service today across North America, while others are used on tourist lines or displayed in museums." Some of these Budd Rail cars will be adapted for use back and forth from Union Station to the airport, on the Georgetown line. Comment from Suri Weinberg-Linsky of the Weston Community Coalition, who sent us the black and white picture: "this photo may be a little older (1951 or 1952) than the ones they are planning on using but it is essentially the right one. Just add two diesel engines per car onto it and put them in pairs -- that's what we are getting! Oh, and paint it blue! That's where the name 'Blue 22' came from -- it's painted blue and would only take 22 minutes under the old plan." 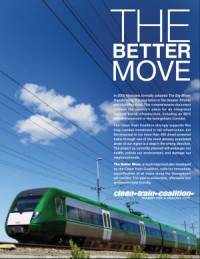 The Clean Train Coalition includes the neighbourhood groups all along the rail corridor. For the most detailed and informative link to neighbourhood-centred attempts to influence the rail corridor project: Weston Community Coalition..
From Glenn Sernyk (Hook Ave Pile Drivers Group): I have attached the Metrolinx Environmental Assessment. Note the section on noise and vibration (pg. 37). The Clean Train Coalition held a press conference at Queen’s Park on May 27 to announce the release of the précis of The Better Move, an alternative vision for integrated rail transit in our region. The Better Move says it's a "much-improved plan developed by the Clean Train Coalition," and it "calls for immediate electrification of all trains along the Georgetown rail corridor. This plan is achievable, affordable and environmentally friendly." For anyone wondering what the future of diesel train service in the Junction Triangle will look like, you can see it on display in Perth Square Park (350 Perth Avenue) on Sunday, September 16 from Noon until 3 p.m.
As part of the massive diesel train expansion now under construction on the Georgetown South rail corridor, the provincial government will be installing five metre high fences all along the tracks bordering our neighbourhood. For this one occasion only, the wannabe engineers of the Junction Triangle Rail Committee will be constructing and displaying the kind of things Dalton McGuinty wants to grow in Ontario, train walls. Everyone will be horrified at the price the government is asking neighbourhoods along the corridor to shoulder in a rush to build a rail link to the airport in time for a two-week sporting event. You don’t need to wait for Halloween to get scared, come out and see how the Pan Am Games is going to divide West Toronto with sixteen feet, four inches of ugly. At great personal expense, we will also be displaying all of the barriers required by clean, quiet, electric trains – something we advocate (along with the rest of the modern world). Don’t be late, we could get arrested for this one. Our event is free and open to everyone, but be warned, these images are disturbing.